I recently moved and have been working overtime to bring a touch of personality to my home. One of the things I’ve spent weeks without is a decent bath mat. So I set out on a mission to make myself something unique that doesn’t break the bank. Here are 16 of the best DIY mat ideas I found around the web. I’m not sure what it is about this bath mat, but it kinda reminds me of the beach. Maybe it looks like a beach towel. 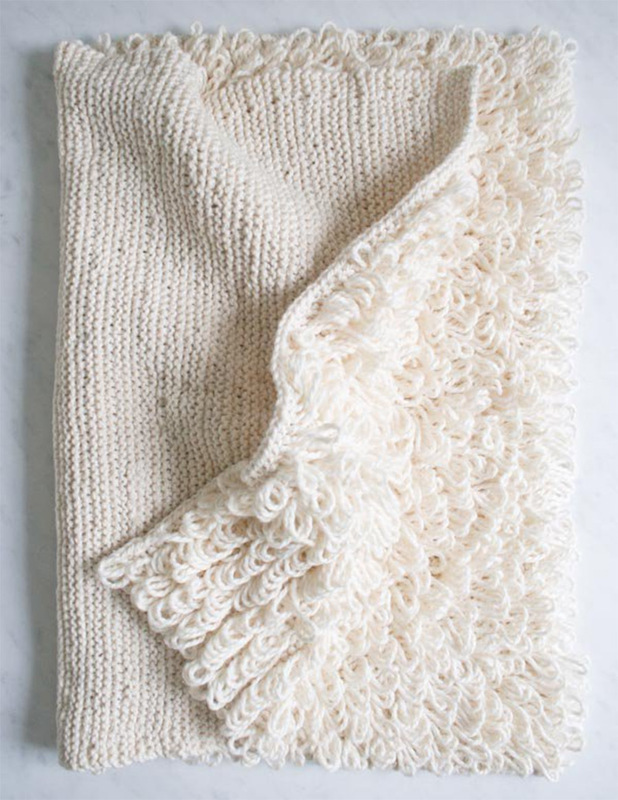 Oh well, I love this chunky woven bath mat designed by Rachel. This style does require some level of skill initially as you need to make a loom and you will be finger knitting. However once you get going it’s a technique that you can do without even thinking about it. 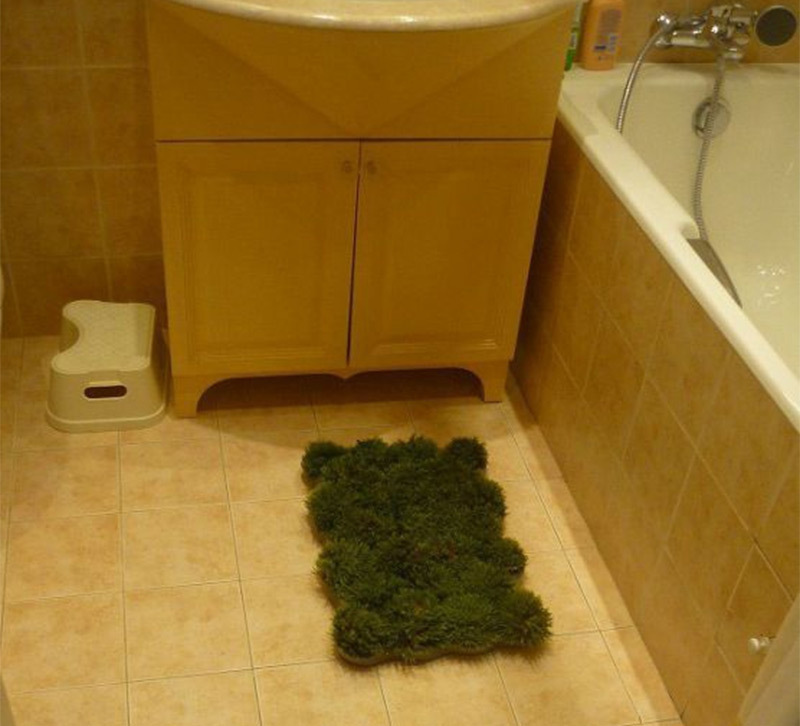 I just love shaggy bath rugs. There’s something so chic about them and I love how absorbent they are. However they do tend to cost a pretty penny. 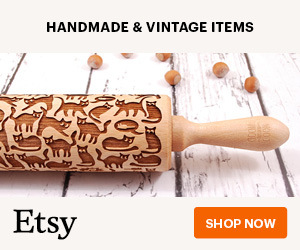 I was so excited when I saw this tutorial on how to make your own. Better yet, it’s eco-friendly since you can make it from your old bath towels that you have thrown in the cupboard somewhere. 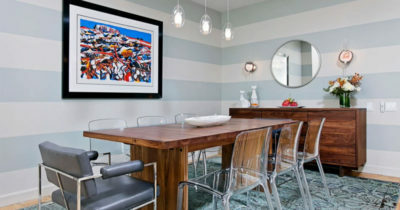 If white is a no go then jazz it up by mixing a few different shades together. 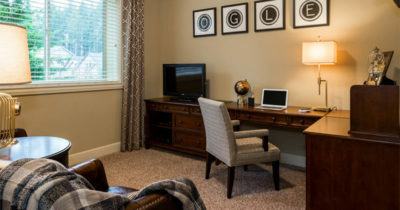 All you need to get going is a latch rug canvas, some old towels, and a rainy day spent indoors. OK so I have to admit, this one’s a little strange. 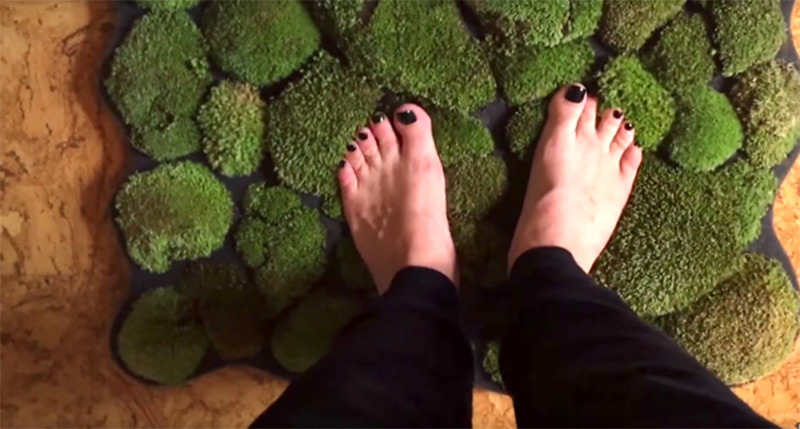 A bath mat made out of moss. Yet the more I think about it, the more I realize it is slightly genius. As moss is a thriving plant, it will quickly absorb all that water post shower. This style of bath mat is actually available in stores but they’re pretty expensive. For a fraction of the cost you can make your own with some high density foam, fresh moss, and a bit of skill with a Xacto knife. 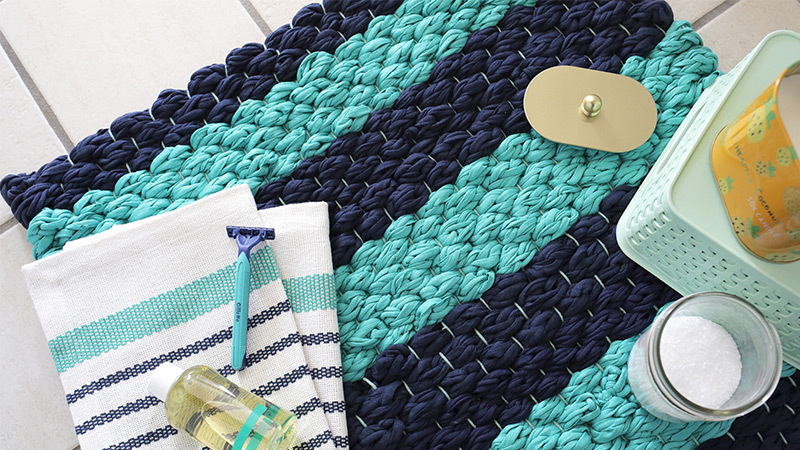 With just 3 regular bath towels and some braiding skills you can make this super absorbent and stylish bath mat. I love that with fairly minimal effort you can create this designer-looking piece for a fraction of what it would cost from a store. 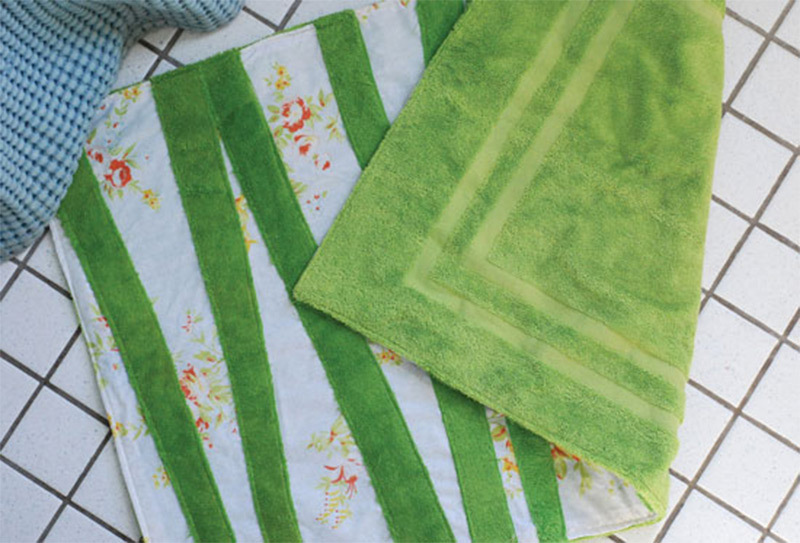 Use towels with a grid pattern for a thicker looking effect. And sorry, the cute little dog is sold separately! There’s something about this pom pom mat that gets me excited to shower! I genuinely never knew how easy it was to make a pom, and with such a fine finish it’ll look like you slaved away for days. In actuality it’ll be more like hours. 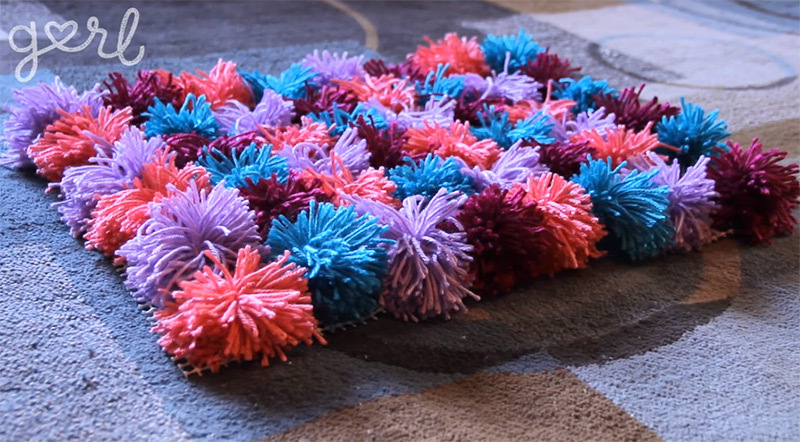 All you need is some string or yarn, some scissors, and a safety mat to attach the pom poms onto. This is 1000% the bath mat I need to feature in my bathroom. It’s hard to believe this bath mat was handmade! It’s definitely for the knitting enthusiasts though. I wouldn’t recommend this one for newbies just getting into knitting. The good news is, however, if you are a seasoned knitter or even have a few knitting projects under your belt, you’ll find this project super easy. Who knew that these little loops would give such a huge effect? 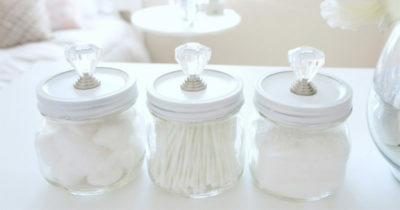 Make sure you use super soft cotton to ensure those tootsies stay cozy post-shower. All you need is 5 skeins of cotton, a couple of needles and some free time. Few things are more annoying than a grubby bath mat, a thousand and one things to do around the house, and you you’ve got no time to throw that mat into the washing machine. With this easy to make DIY project this won’t be a problem. It’s machine washable, super squishy, and makes great use of old towels or cotton sheets. The cotton sheets allow you to add a fun and jazzy pattern to a plain old bath towel. You can even stitch different colored towels together. A great way to recycle. I adore cedar bath mats. What I don’t adore is how expensive they are. 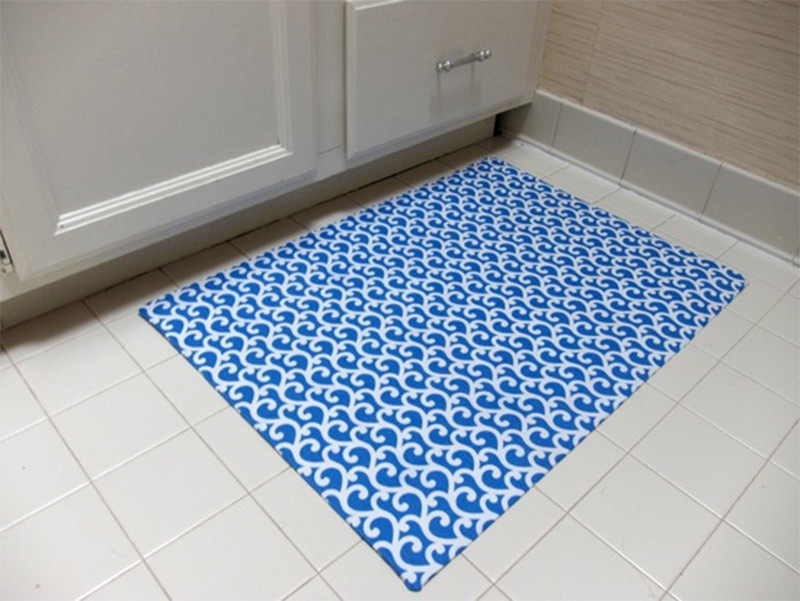 As long as you’re fairly comfortable using a circular saw, this bath mat is easy to make and is a quick way to brighten up a bathroom that needs a little TLC. Head to your local store to pick up some cedar and some finish. 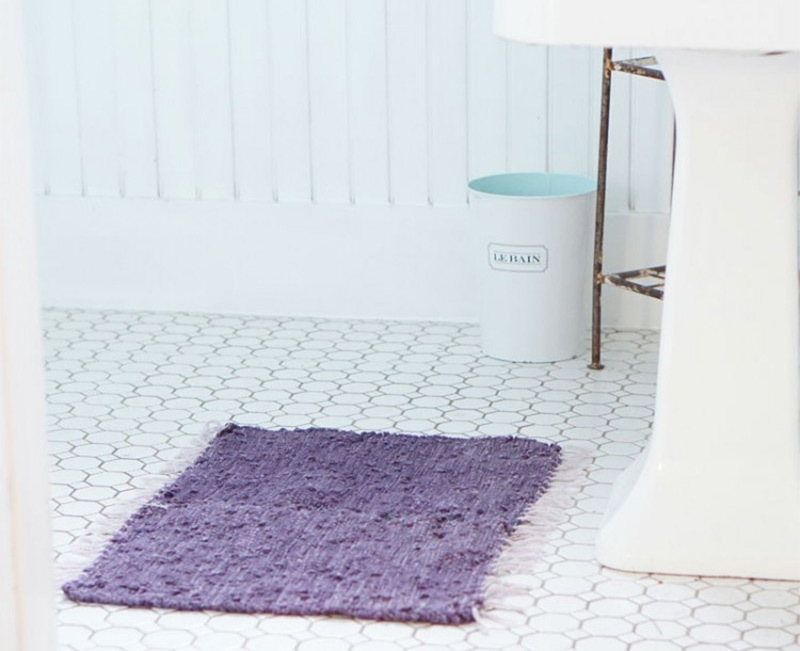 In a couple of hours with this tutorial you’ll have a clean, naturally absorbent bath mat that gives your bathroom an ultra-modern spa like feel. 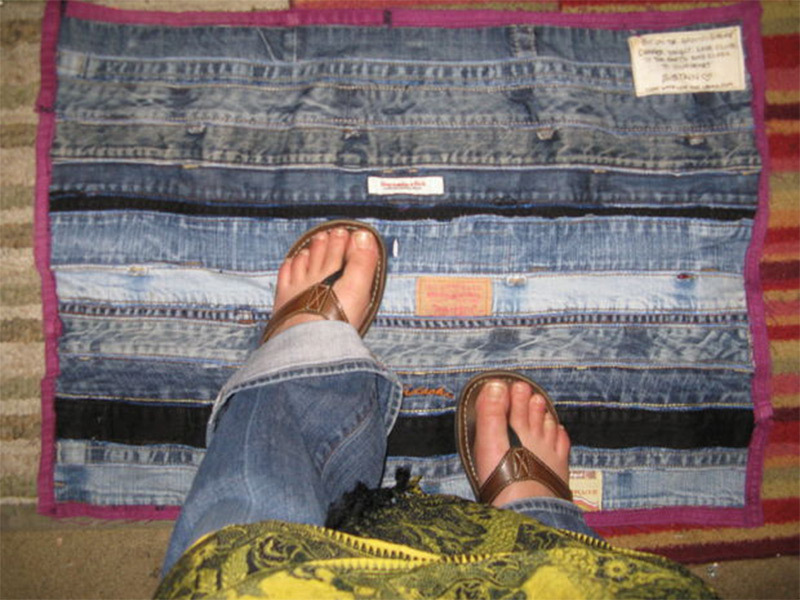 Hands up those of you who have a whole heap of jeans in your closet that you never wear! Instructables user passionfly has come up with the perfect solution to get rid of your unwanted denim. This is probably the most unique bath mat I came across when looking up these projects. 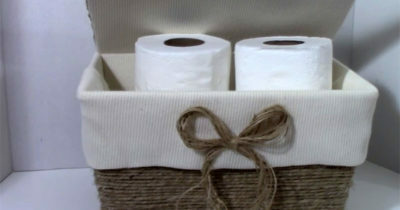 Use a brightly colored material to create the perfect trim or even mount on top of an old towel for extra absorbency. And, because this is made from jeans, it’s machine friendly. 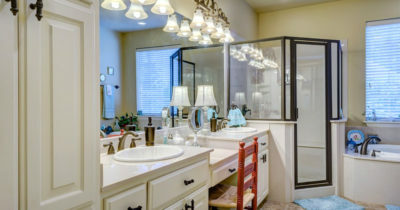 If you live close to the beach this is the perfect way to bring the ocean inside your bathroom. I love the how creative this looks and it’ll surely be a talking point when you have guests over. 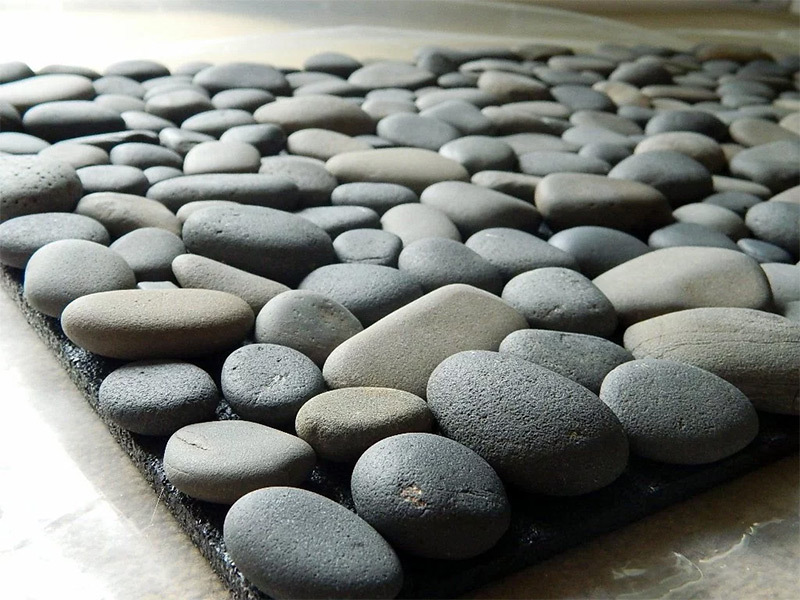 You will need some silicone sealer and a rubber mat with holes(for drainage) to mount the stones. Make sure the stones you pick are porous and not slick. You don’t want to slip fresh out of the shower. 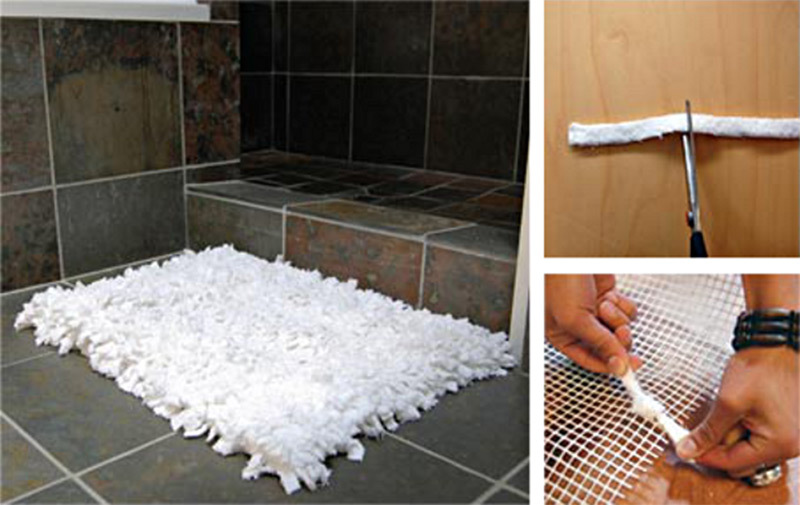 This option has to be the quickest DIY bath mat you can make. 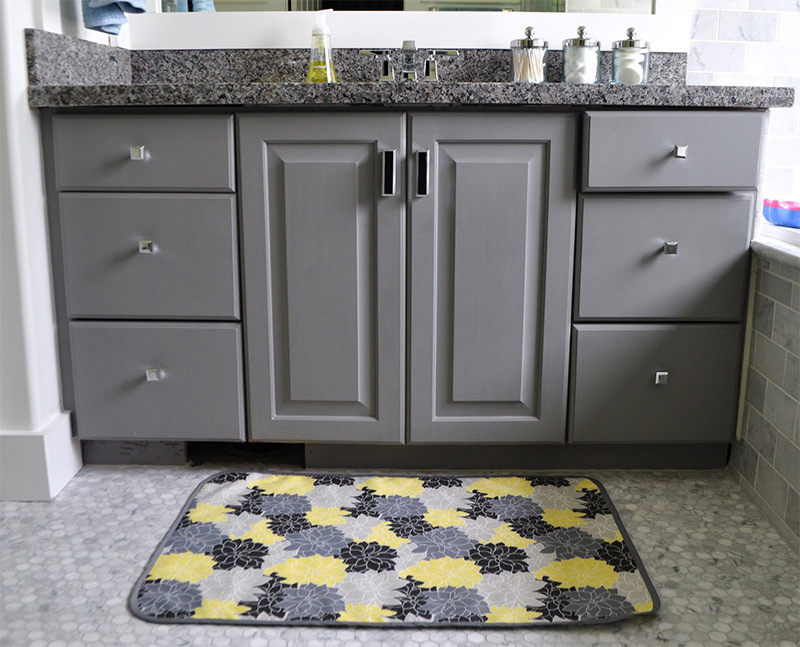 In just fifteen minutes, Amy managed to quickly transform two old fabric placemats she grabbed from a thrift store into a vibrant and funky bath mat. 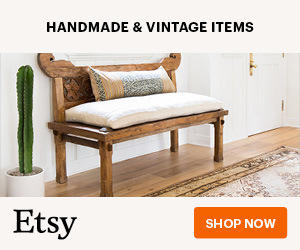 This is upcycling at its best. Perfect for those of you who need a quick solution. 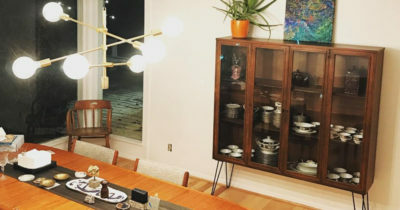 Even though this mat isn’t exactly a start-to-fnish DIY, you have to love Allison’s creativity and ability to think outside the box when adding the finishing touches to her home. 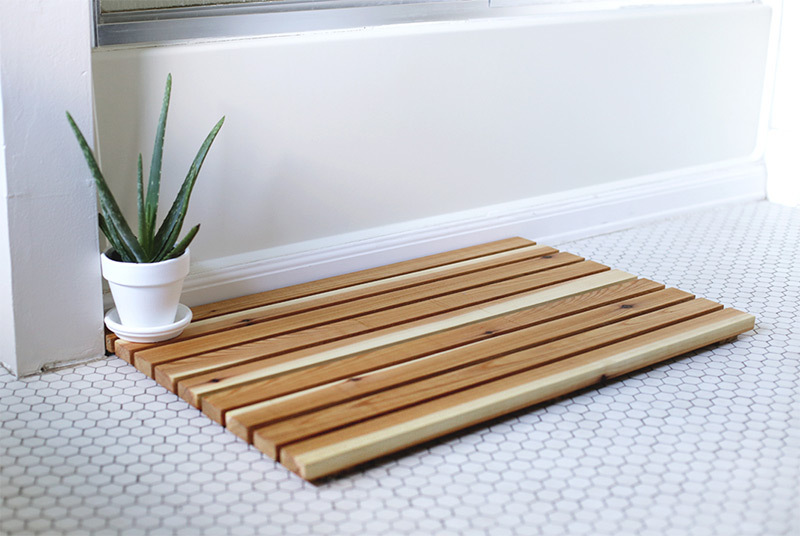 For this ultra-chic looking spa-inspired bath mat, she used outdoor decking that just snaps together. Too easy. Better yet, she picked this up in the sale aisle at Ikea. I can see myself spending countless hours looking at the reduced section in the store from now on. Ideas, come at me! 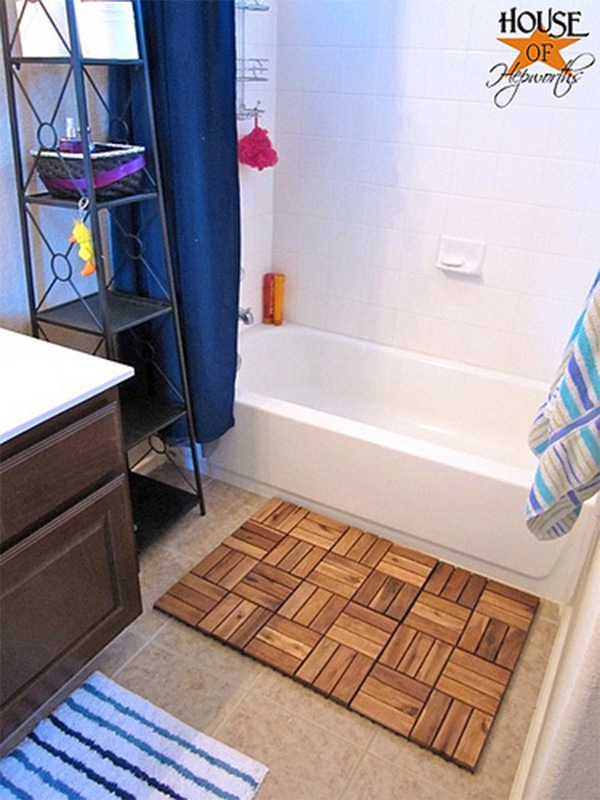 I’m such a fan of these super cheap and easy to make bathmats. Like Cheri, if you have multiple bath mats to purchase, spending $20-$30 bucks on each one is just a drag. There are far better things to spend your hard earned cash on. The patterned side for this DIY mat is outdoor fabric and the soft side is terry cloth. This is perfect as it stops the mat from being too slippery. You can pick up the fabric at your local craft store and the sky’s the limit with design options here. Do you enjoy spending summer days strolling barefoot in the grass? If so, this is the mat for you. All you’ll need is some thick foam and a good cutting knife. Plus a trip down to the garden center to get some grass. Simply place it in the holes and presto! Your wet feet should provide plenty of moisture to keep the grass live and kicking in your bathroom. 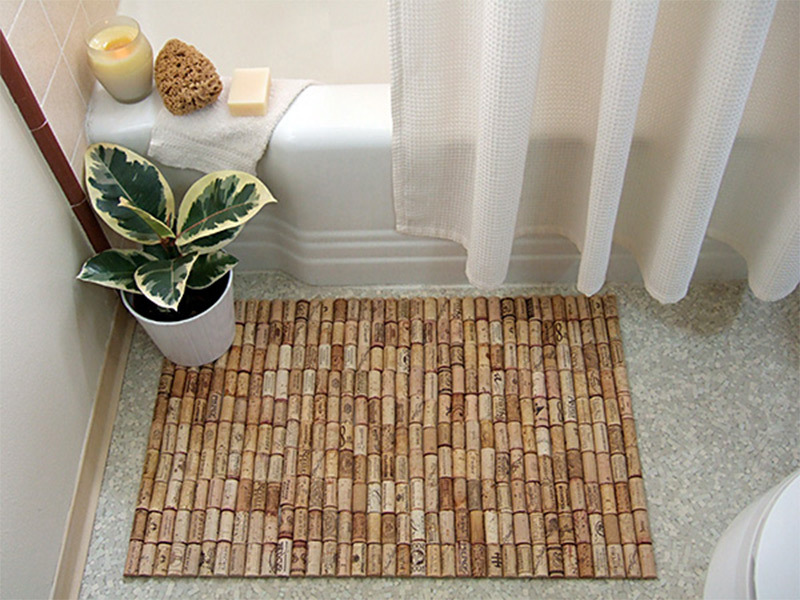 Yet another stylish fabric-based bath mat ready for your bathroom. 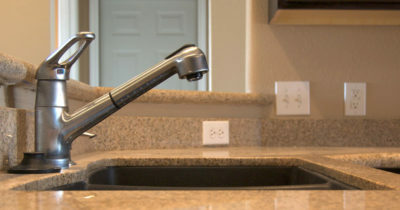 This one is super versatile and can be used in other rooms as well as the bathroom. Diane had an ugly old piece of vinyl lying around the home and decided to back it with some fabric bought in her local fabric store. Then simply used polyurethane to coat it making the mat super easy to clean. The thing I love about these fabric mats is that the style options are endless. I love the colorful contrast for this one as it brings a pop of life to the bathroom. 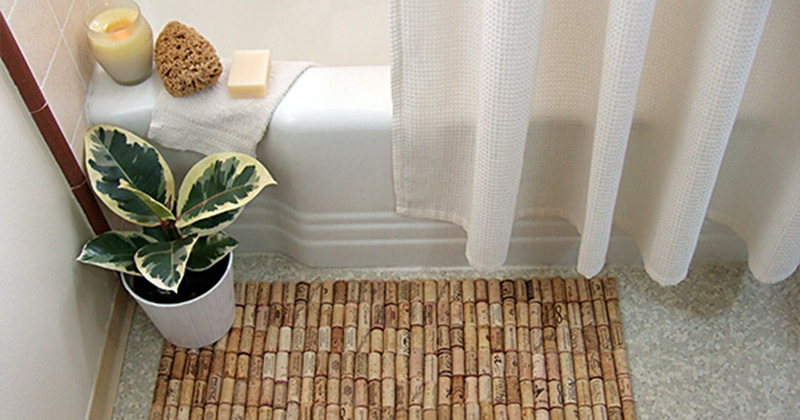 This intricately designed cork bath mat takes a whopping 175 wine corks to make. So even if you do consider yourself a bit a wine connoisseur, you may need to seek the help of friends or head down to a local restaurant to see if they’ll donate some leftover corks. You can also find them online if you search around. But the great think about corks is that they’re naturally absorbent. All you need is a glue gun and a shelf liner to stick them on. 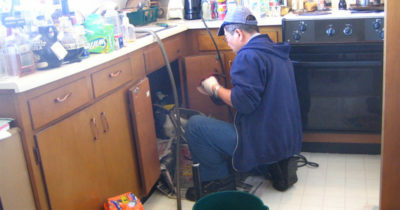 Max results for very little cost!